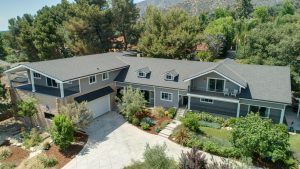 Last month the most expensive home sold in La Crescenta September 2018, was 5230 Briggs Ave. This home listed for $2,750,000 and sold for $2,350,000 after sixty-seven days on the market. The sellers bought this home in 2014 for $1,560,000. At this time the home was just three bedrooms and four baths, 3860 square feet. After their purchase they converted the hobby shop above the garage to living space enlarging the home to a total of nearly 7,000 square feet. MLS Remarks Read: Napa Valley Farmhouse set on a scenic half-acre with mountain and valley views. This impressive property has been transformed into a stylish compound. Perfect for an extended family. Both the main house and guest wing offer a tremendous sense of space. With open floor plans, soaring ceilings, light-filled rooms, and expansive balconies. Stunning interiors include wide plank oak floors, barn doors, contemporary light fixtures, and a glass-enclosed wine room. Casual California living also allows for entertaining on any scale. The huge 3,311 sq ft garage includes a full pub, a gym, and room to park 4 cars. An avid car collector could open the space to house as many as 14 vehicles. Smart home with Nest thermostats, LED lighting fixtures, Lutron switches, high-efficiency heating & cooling units. Mediterranean-inspired landscaping with olive, fig and citrus trees, low stone walls, white roses, lavender, and raised beds for vegetables. Blue Ribbon Schools. Adjacent to La Canada with easy access to the 210 and 2 freeways. You really can have it all! The Dilbeck Estates Division was created to address the special needs of our clients in the luxury real estate market. In turn, we have nurtured relationships with some of the top estate partners to deliver an unparalleled experience in luxury sales. Since the creation of this program, we’ve developed a reputation for our expertise, expansive network of experienced agents and pioneering marketing strategies. Interested in learning more about luxury real estate in the Foothills? Give us a call.